The Aquarium's seafood bycatch work was recently featured on the front page of the Science Section in the New York Times. Bycatch refers to the collateral mortality of non-target marine animals, such as sea turtles that get caught and drown in fishing nets. Bycatch is one of the principal threats to marine biodiversity worldwide. Researchers Tim Werner and Scott Kraus are both quoted in the article, which discusses bycatch issues including cooperation among scientists, fisherman and regulators as well as gear modifications to prevent bycatch. 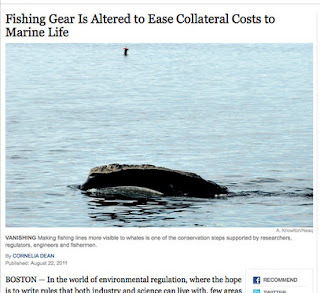 The Boston Globe also tackled the important issue of bycatch in this recent editorial. These are terrific pieces and invaluable forums to discuss some of our research, conservation and education efforts with an international and national community. Most fishermen have just as much desire to avoid bycatch as conservationists do. The Aquarium researchers are continuing efforts to identify the most practical solutions in collaboration with the fishing industry.